What does the term ‘creating value from values’ mean? It is in fact a powerful concept for companies to use. Ultimately, it is a strategy for developing the future market while also strengthening economies, the marketplace, communities, and corporate money. Have you ever stopped to consider that the word values contains the word value? We talk about them as two separate and often very different words. 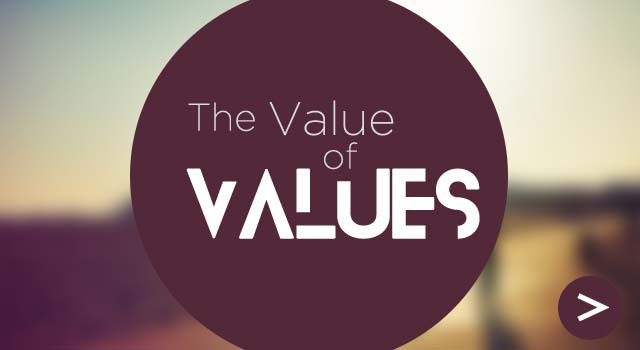 Often strategy, finance, operations, people talk about value in economic value or added value, and human resources, communication, and marketing people talk about values in the terms used across business values and brand values. Yet value sits inside values; a powerful combination of human and financial factors. Do we treat them separately, discuss them separately, and give them to different departments to deal with separately? Surely, delivering values needs to be adding wealth creation by adding value. Building brand values, builds brand value. Building emotional values builds economic value. If people believe in what they do, are committed to delivering, and in a way that satisfies their customers, then the community in which they work and as a business will benefit as a whole? 1. What’s important to us as a business? 2. What do we value? 3. What our customers, our staff, and their suppliers say about us? 4. Do we deliver on time, every time? 5. Do we make sure that we follow quality control? 6. Are we passionate about what we do? 7. Do we announce good news stories? 8. What do we dislike about what we do? The above questions are values that can deliver value when everyone in the organisation is working to live up to their values; in simple terms, the things that are important to us, the things ‘we’ care about, what makes are job and purpose worthwhile. It is imperative that the values are developed across the company to be effective and from the board down, otherwise the ‘we’ will be meaningless and risk being treated with disdain by the majority. Even more important is to turn the values into behaviours that represent value creation. A shared value creation will involve new and heightened forms of collaboration. While some shared value opportunities are possible for a company to seize on its own, others will benefit from insights, skills, and resources that cut across profit/nonprofit and private/public boundaries. Here, companies will be less successful if they attempt to tackle societal problems on their own, especially those involving cluster development. Successful collaboration will be data driven, clearly linked to defined outcomes, well connected to the goals of all stakeholders, and tracked with clear metrics. Previous PostPrevious With the impact of Social Media, do we actually plan for crisis management? Next PostNext Can you create a meaningful life out of something you love?